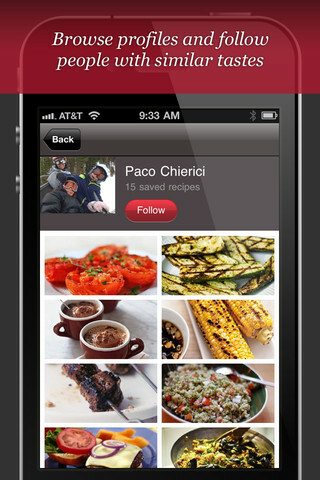 The Foodily app for iPhone, iPod Touch, and iPad is a social cookbook, since actual cookbooks are so 2010. You no longer need to schedule and reschedule coffee with your girlfriends or lunch with your BFF to hear about great new recipes, tricks, and tips. 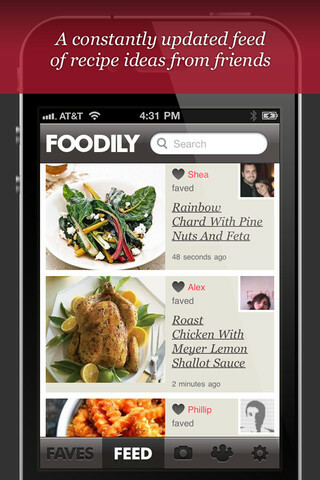 Foodily’s database of recipes from across the internet is quickly accessible from your PC, iPhone, iPod Touch, and iPad. The interface is efficient, beautiful, and easy to navigate–with one exception. When you open if for the first time, you are encouraged to connect via Facebook or email. But, strangely, Foodily instantly assigned me users to follow, and I couldn’t figure out how to find users to follow. I jumped online, and Foodily guided me through my food preferences like “Kid Friendly,” “Gluten Free,” and “Entertaining.” And, a la Twitter, a group of people following similar topics popped up. Now, I had people to follow. The real beauty of the Foodily app is the search mechanism. You have leeks, then you search for leek recipes. The photography is gorgeous, and the ingredient list is shared. You comment, add photos, add to your favorites, and check out other followers. The Foodily app for iPhone, iPod touch, and iPad gives you the option of clicking through to the person who posted or created the dish. This feature allows you to expand your online experience as well, and that’s a great bonus. You will appreciate the ability to find a recipe and fave it while sitting through basketball practice. Then, on the way home, you stop by the grocery, pull up the recipe, and grab the ingredients. It’s a great tool for creating a meal for your family on those hectic evenings or for creating a spectacular dish for the spontaneous neighborhood cocktail party. With the Foodily app for iPhone, iPod Touch, and iPad, you can at least pretend to do it all and be completely put together. The Foodily app for PC, iPhone, iPod Touch, and iPad has that same addictive quality as Pinterest. Soon, your foodie friends will be filling your Foodily and Facebook feeds with great recipes. AppSafari review of Foodily was written by Jenni Ward on November 17th, 2011 and categorized under App Store, Food, Free. Page viewed 4921 times, 1 so far today. Need help on using these apps? Please read the Help Page.